That sounds like a logical first step! Go to Socialcast’s website and enter your email address. You’ll get a message in your inbox shortly thereafter instructing you to activate the account. The email address you use to create a new account must be from a specific domain. Gmail, Yahoo! and other free email addresses aren’t eligible. If you don’t already have a domain name, you can buy one to use from any number of domain name sellers out there in cyberspace, such as Dotster. After you receive a confirmation email back from Socialcast, open it, and click that Activate button to get going. Your browser will open the Socialcast registration page for your new community. You can change the name of the community later if you prefer something other than the domain name. Complete this form and click continue. You won’t have any colleagues to connect with just yet, so skip the next screen. There won’t be any groups set up yet, but if you think you’ll want to use a few of these, tap on the ones you want. Then click on the I’m Finished button, and you’ll land on the home page for your community. There won’t be any groups set up yet, but if you think you’ll want to use a few of these, tap on the ones you want (you’ll fill in the details later). 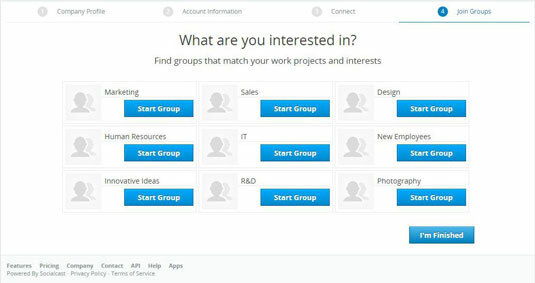 Then click on the I’m Finished button and you’ll land on the Home page for your community, where the real action begins. On the far left, you’ll see the vertical strip of icons. These icons will take you to the six main areas of Socialcast: Streams, Groups, Private Messages, Projects, Challenges, and Explore. In the middle is the activity stream. By default, all the different streams appear at once. Click the Streams icon to see specific types of activities, such as those you previously bookmarked. On the far right at the top, you’ll see your name. Click on your name to bring up your profile. If you click on the gear next to your name, you’ll see another menu with some really important options: Settings, Admin Settings, Apps, and Log Out. Assuming you’re going to be the person in charge of the Socialcast site for your company, you’ll want to give yourself administrative rights. So click on Admin Settings, then complete the form, read and agree to the terms and conditions, and click Claim admin. Socialcast confirms the action. Now go back to the gear and click Admin Settings again. 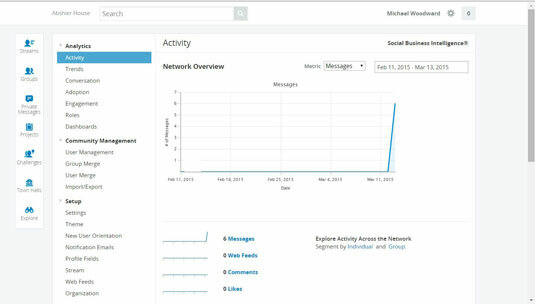 Analytics: Here you can see a variety of different visual representations of data related to your Socialcast community usage. Not much here yet, but once your site is humming along, you’ll have all kinds of fascinating trends to watch. Community Management: Of note in this section is the User Management page, where you can see who all has set up their accounts and whose invitations are still pending. Setup: Perhaps this is self-evident, but this is where you go to change settings like the community name, default language, themes, and the like. Security: Change your password, control the size and types of attachments users can add to messages (if any), block or approve certain host names and URLs that users can or cannot connect to within Socialcast. Features: This section lets you turn the listed features on or off for your community. 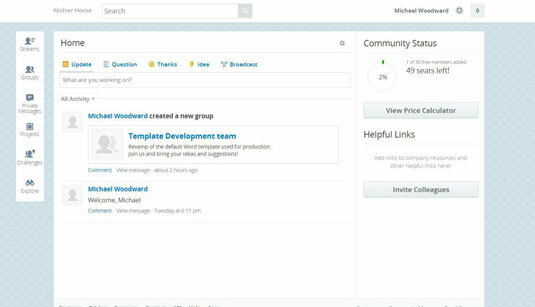 Integrations: Use these options to connect your community to other popular products and apps, such as Outlook, Hootsuite, and the various Socialcast mobile apps. After you’re done tinkering, you can go back to the Home page and set up your own personal profile, invite new users to join, and more.